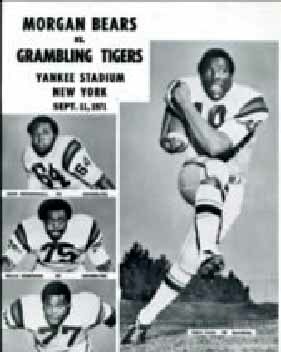 In 1971, the first Classic- then known as the Whitney M. Young Jr. Memorial Football Classic (named after the National Urban League’s Executive Director), was played between Morgan State University and Grambling State University at Yankee Stadium. More than 64,000 fans crammed into Yankee Stadium and saw an intensive defensive struggle between Morgan State Golden Bears and Grambling State Tigers which ended in a 9-7 victory for the Bears. New York City also got its first taste of the Black College Battle of the Bands as Grambling State and Morgan State’s marching bands electrified the crowd. 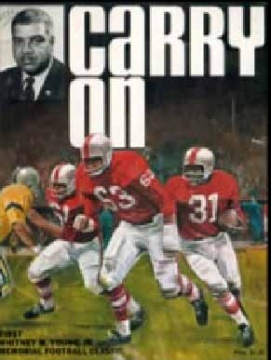 It was the first Black College Football game to be aired on national television. Yankee Stadium became the site for some of the Classic’s most memorable match-ups. The last game at Yankee Stadium was played in 1987 before the venue was moved to Giants Stadium in the Meadowlands in New Jersey. The classic was renamed the New York Urban League Classic.